When we got there we found out that due to safety checks on the line between Haymarket and Waverley, trains (if they weren’t cancelled) were stopping at Linlithgow, about 20 miles from Embra, and it was up to you to get from Linlithgow to Embra. That’s Scotrail for you. Make it up as you go along. If the problem is between Haymarket and Waverley, both in Embra, why are they stopping the trains 20 miles away? That’s a pretty big safety zone. Must be the wrong kind of leaves on the line again. Anyway, we told the nice ticket man that we wouldn’t be travelling on his maybe-not-cancelled train today and drove home to change cars and drive (me driving this time) to Perf, not Embra. It was a pleasant drive up the A9 to the Fair City of Perth. Car performed perfectly and I finally got the hang of the new cruise control. I also tried out the speed limiter, but that’s not as much fun. Best of all, I tried out Sport mode which gives you a nice little whack of G-force as you accelerate! Only to be used sparingly as it does eat up your fuel consumption. All in all it’s a really nice car to drive. I’m very impressed. Perf was busy as usual on a weekend. Far too many people around I much prefer going on a weekday. Got some coffee, some tea and some dried fruit to make my breakfast compote. Fruit for the compote, there’s no coffee or tea in it. Just thought I’d make that clear. 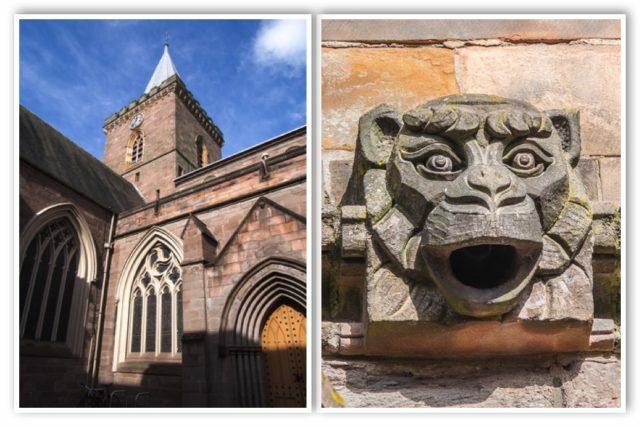 While we were there and while Scamp was shopping in Marks, I wandered round the outside of St John’s Kirk, the big church in the middle of the town. I got a sketch done. It’s a bit ropey, but with a bit of tweaking from the photo I took, it should do. Tomorrow is the start of Inktober 2017 and I need to get myself back in harness to do a sketch a day. There’s a wee challenge for you Hazy. One sketch every day, posted on Flickr. You can add it to my group if you want. Only one real rule. The predominant medium must be ink, hence the name. You too, JIC. Get started sketching. Fifteen minutes in your lunch break is all you need!! Today’s PoD is a wide angle shot from the walk round the church. I also liked the monkey gargoyle! A couple of weeks ago Scamp came across an envelope from a school venture with a £10 note in it. It was surplus money from a school trip we went on twenty odd years ago. It wasn’t my money and the school doesn’t exist any more, so today it went into a charity tin in the Heart Foundation shop in Perf. They will be able to use it. I’d already checked with the bank and it was still legal tender. Back home, dinner was a Scamp speciality, Prawn Stir fry. Spicy and hot, but very, very good. 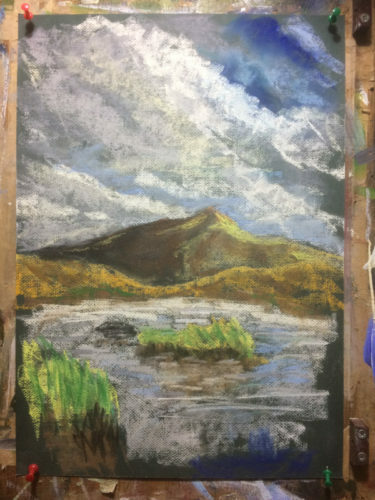 I’d been reading a book about painting with pastels in an Oxfam bookshop in Perf. I don’t think you draw with pastels, you paint with them. I hadn’t really used pastels, except for messing around with them for a graphics topic for school. Today I pinned a sheet of Ingres paper on an old drawing board and painted a landscape. The same one I’d been tentatively poking paint at for the last week. This one took maybe half an hour? It’s rough, but I like it. Maybe I’ll fix it and frame it. Tomorrow looks wet. I think we’re going dancing at night because the usual Sunday Social venue is double booked and we lose. Should still be fun.